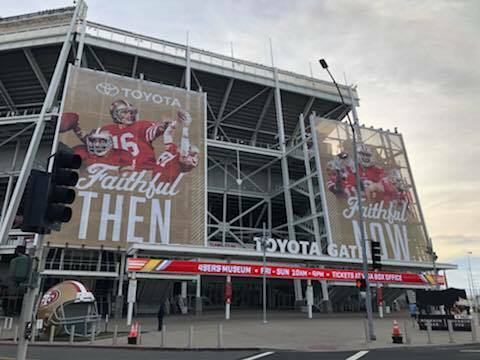 SANTA CLARA, CALIF. (January 26, 2019) –The first California Concussion Institute Symposium presented by Dignity Health and West Coast Sports Institute was held at Levi’s Stadium, home of the San Francisco 49ers. A discussion panel was open to the public that featured Javier Cardenas, MD (neurologist and director of Dignity Health St. Joseph’s Hospital and Medical Center’s Barrow Concussion and Brain Injury Center and team physician/concussion specialist of the San Francisco 49ers and San Francisco Giants), Michael “Micky” Collins (co-founder of ImPACT Applications), and Anthony Saglimbeni, MD, Dignity Health Concussion Network Physician Champion. 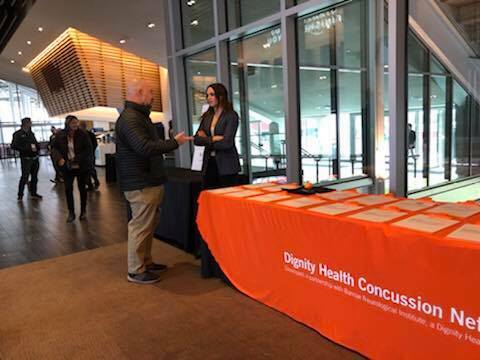 Dignity Health Concussion Network, provides concussion education materials to medical professionals, student athletes, their parents and coaches, and to the general public. Together, the panel of concussion experts addressed the epidemiology of concussion, current care practices, and truths and myths of the injury. At the end of the panel they invited an open question and answer session for everyone in attendance. Panel attendees primarily included teachers, coaches, athletes, and their families. This premier continuing education event brought together top health care professionals in the country who are involved in concussion management. The symposium offered a unique educational opportunity for physicians, athletic trainers, physical therapists, other health care professionals, and the public to collaborate and learn. Emily Murrer, manager of the Dignity Health Concussion Network, shared with panelists and attendees that approximately 450,000 student athletes in Arizona and California have participated in the network. Dignity Health is educating students and training coaches and athletic trainers on concussion prevention and treatment methods. The Dignity Health Concussion Network is a concussion education and prevention program that combines baseline and post-impact testing, e-learning, and telehealth consulting to champion the safety of young athletes. Dignity Health launched the initiative in 2015. California Concussion Institute is a specialized concussion facility specializing in injuries related to head trauma. They use the industry’s leading technologies to diagnose, treat, and aid in the recovery process for patients diagnosed with concussions. The California Concussion Institute Advisory Board is made up of health care professionals across all disciplines and all athletic settings.